Vaccinations; are your choice, make an informed one. » Parents Anecdotes » Another child in a Million, another vaccine? If you are researching about vaccines one comment you will often hear is that the the risk from a vaccine is “one in a million”. Its never explained how the reach this figure and how its the same for all vaccines. When Vera Duffy got in touch with the chief medical officer in Dublin an asked him about the risks from the DPT vaccine she was told it was one in a Million, when she told the medical officer her son Alan was the “ONE” she was told it was “impossible” and accused of deceit in getting access to the man. If its your only child that is injured, statistically its its 100%, what is it they say about statistics; Lies, damned lies and statistics! Tagged Vera Aiden Quinn. Bookmark the permalink. 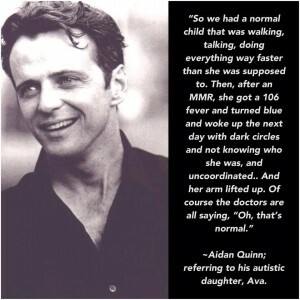 One Response to Another child in a Million, another vaccine?